This is pretty awesome. 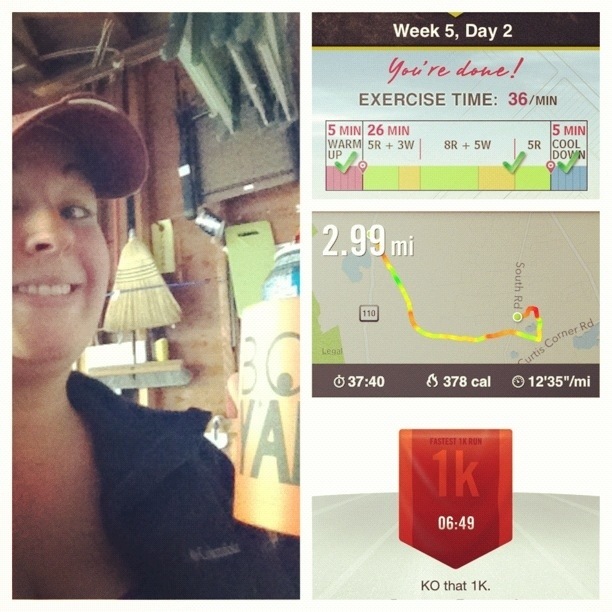 Do you ever feel like “screw this thing, I can run more than that!” and do more than you’re supposed to? 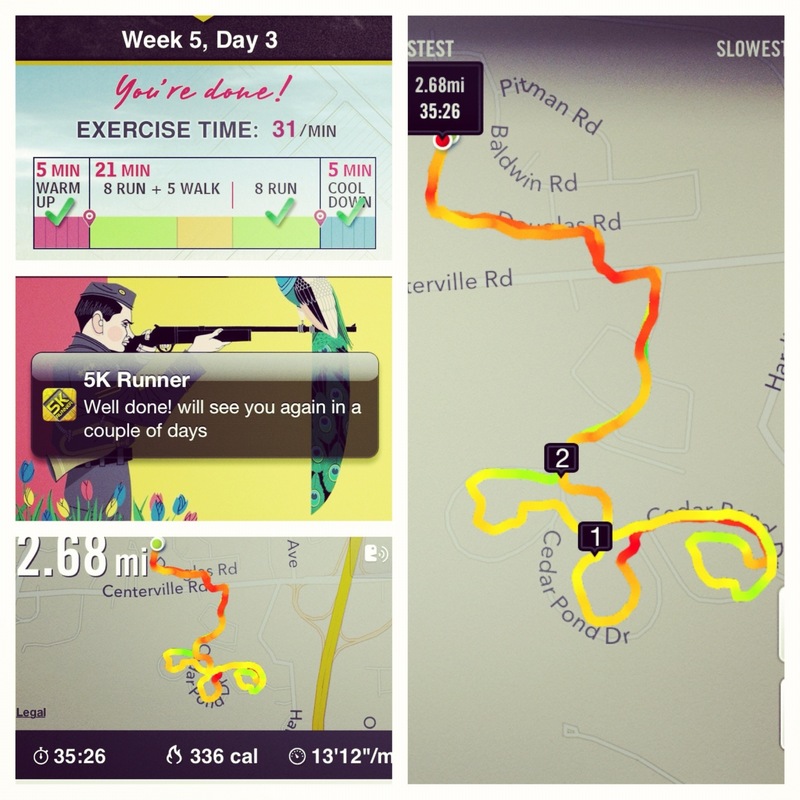 Seems like, by now, you could do a straight 3 miles… aren’t you tempted to try!? Tempted, yes. 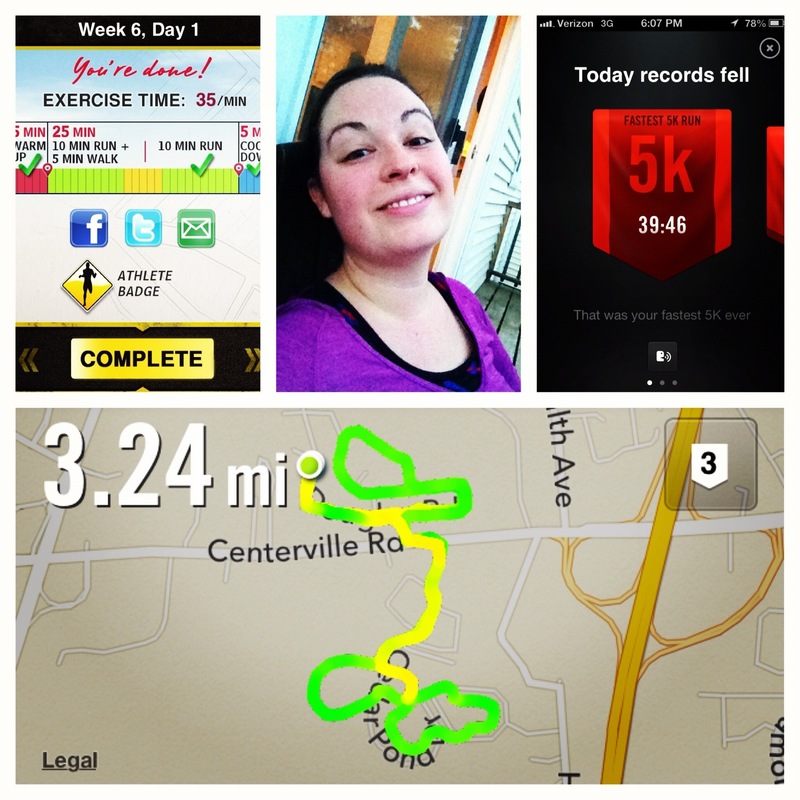 But everything I’ve read on C25k says to just stick with it and don’t try to do more. 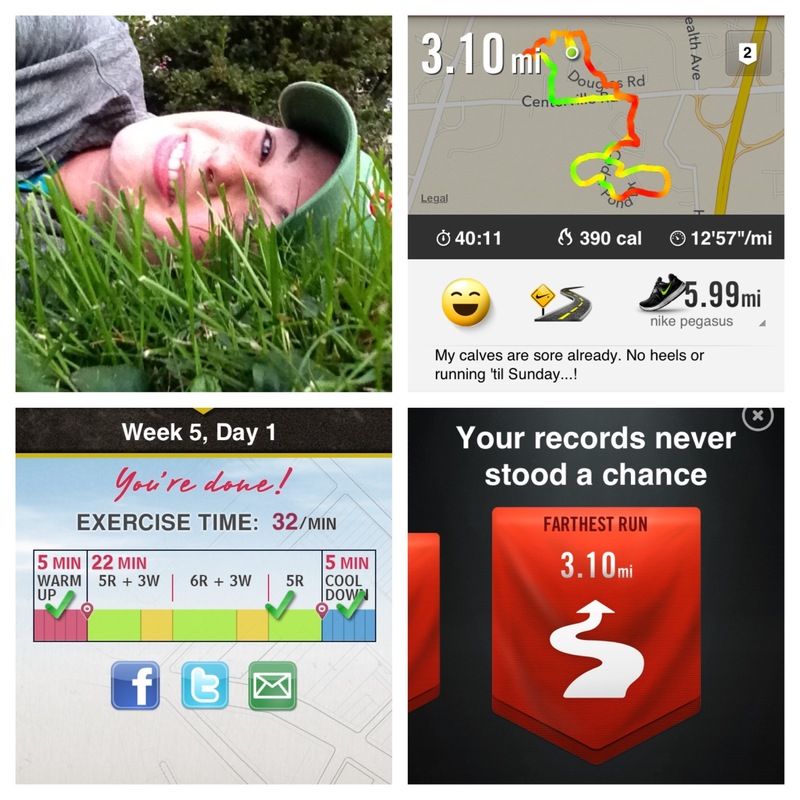 From this point on–week 7, 8, and beyond–it’s all running, no walk breaks, and the tines increase pretty steadily from 20min to 35 min, and then I’ll run however long it takes me to go 3.1 mi a few times before my race. I think that by restraining myself I am mentally psyching myself up. 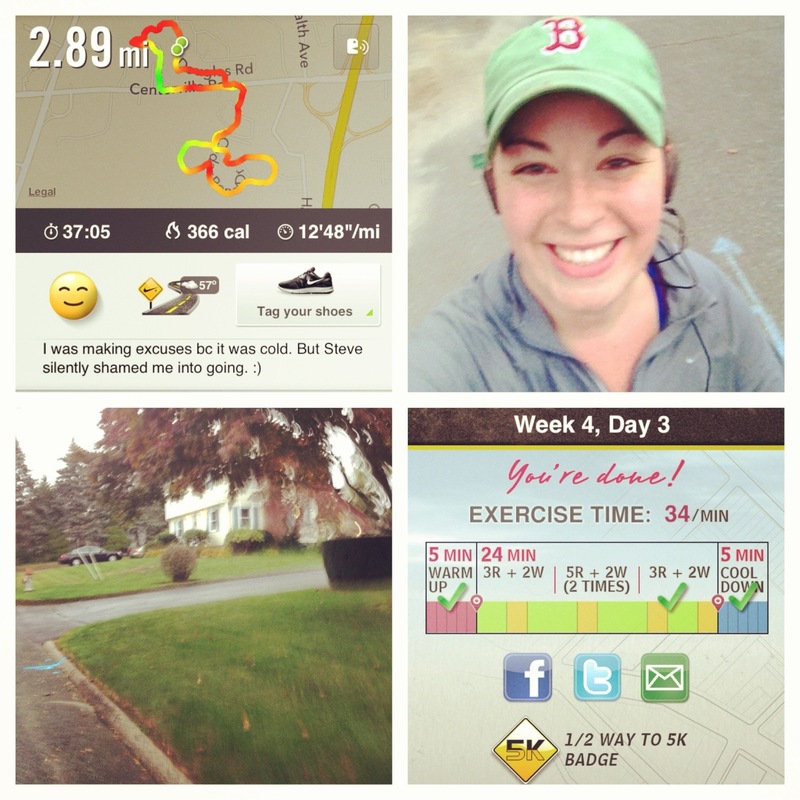 Like, when on Tursday I ran 1.3 mi nonstop at a decent-for-me pace and felt great about it, I could look back and say “that was easy!,” which motivates me for my next run. So by ending on a high note every time and not getting wiped out, I am always looking excitedly forward to my next go. I realize that as I type it, it’s a bit playing it safe, but I guess I need that to just get there. Once I know I can do it, I’ll start challenging myself and pushing forward. Hey- as long as you feel accomplished at the end, that’s what matters (well, that and the calorie burning). And getting started is the hardest part. You know how marathoners have mantras? Well, sometimes I need a mantra to help me finish a regular run (i.e. 3-5 miles) and 90% of the time that mantra is “You only have 3 (or 4, or 2, or whatever) minutes left. You can do anything for 3 minutes.” Does that sound familiar to you? Haha yes. I mean, “30 days and a wake up”–it worked!